Hot Compressed Air (HCA) systems are ideal for demanding surface preparation tasks requiring an element of heat. The SPE pedestrian system is unique & self contained - eliminating the need for a seperate air compressor. The SPE HCA Pedestrian System is a unique diesel driven Self contained design which enables it to be operated without the need for a separate air compressor. 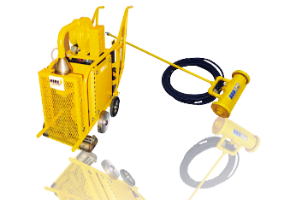 It is a high performance, heavy duty pedestrian operated machine for the treatment of oil impregnated concrete floors, general drying for road markings and wet/damp surfaces prior to various applications. It can also be used to clean and heat road joints and for softening prior to re-texturing.